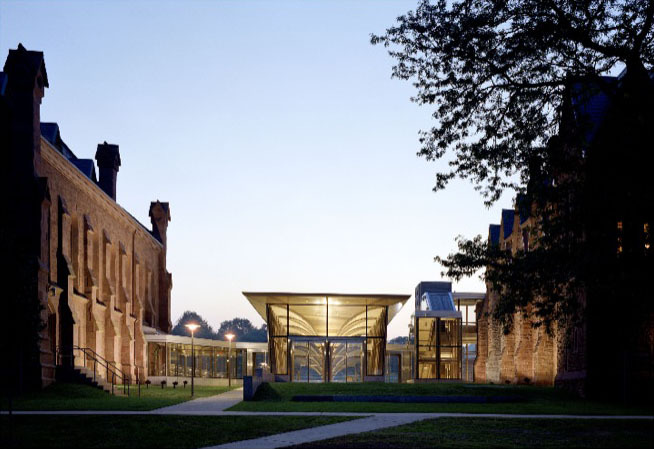 Wesleyan University was founded in 1831 as a liberal arts college and this project includes an adaptive reuse of two of its earliest buildings. Today Wesleyan’s 360-acre campus with more than 340 buildings in Southern New England along the Connecticut River serves approximately 3000 students and 300 faculty. This project created a performing arts center in the middle of Wesleyan’s campus. The challenge was to site a new building that would provide an accessible path through the site, into the buildings, with principal entrances from both the historic front and the rear and the modern main campus walk while maintaining the integrity of the historic resources. The complex consists of Memorial Chapel, now a 620-seat space for choral music, organ, and orchestral ensemble, lecture and worship; Patricelli ’92 Theater (formerly Rich Hall), a black box theater for 150. The new Zelnick Pavilion provides a lobby for both buildings as well as audience services and building systems and makes Memorial Chapel and Patricelli ’92 Theater accessible. The project included a complete exterior restoration of both historic buildings, Wesleyan’s first two buildings on College Row, including historic slate roof, brownstone restoration, historic window and door replacements, and stained glass conservation. The first phase of the work at Wesleyan University, begun in 1998, was a study of the Wesleyan University Center of Campus. Here Robert Olson + Associates focused upon opportunities to rejuvenate Wesleyan’s historic core campus to provide new centers for community and student life. They provided the University an assessment of its historic building and landscape resources, a program of potential uses for the Center of Campus developed from in-depth consultation with the University community, a strategy for adapting the historic buildings to these new uses and a conceptual design solution. The solution was in two parts: the development of a student center at the northern end of the core campus and the restoration and renovation of the Memorial Chapel and the ’92 Theater. Robert Olson + Associates reconfigured Memorial Chapel to provide a remarkably flexible set of uses. The new space provides space for worship by different faiths, a center for musical performance, and a setting for University-wide assemblies, teaching, films and distinguished lectures. The architects revived the Chapel’s origins as a meetinghouse by reclaiming an upper gallery level for seating, incorporated a new organ into the architecture, and created a worship platform which is fully integrated into the congregation and is universally designed. They reshaped Memorial Chapel to increase the seating by nearly 200 seats and to provide a more supportive and functional performance space. In addition, to create adequate performers’ warm-up and support space, they lowered and reconfigured the basement floor. Finally, they worked closely with the University organist on the design of a new organ, which is fitted to the new space, and which is used both for teaching and recital. They rebuilt the ’92 Theater as a state of the art black box theater principally for dance and theater but also as a teaching space. They designed it to provide an accessible performance space and to preserve and provide access to the surviving historic resources of the building interior. A student-run theater with weekly shows, the space offers fully accessible performance space and performers’ support spaces. The black box is equipped with a complete theatrical lighting system for performance, as well as house and work lights over the flat floor and complete motorized daylight control to permit complete flexibility for performance. The house lighting includes lighting systems which reveal and use the historic wood ceiling as a lighting source before and after the performances. When the room is used for teaching, the daylight control blinds are opened to admit daylight. The new Zelnick Pavilion provides environment controls and audience space while increasing the capacity of the hall and minimizing effects of mechanical noise on room acoustics. The addition provides a lobby, inclusive access and egress for both buildings above grade and a home for building systems below grade. The total cost of the project was $23 million and it was completed in 2006. Colored image from the street shows a dramatic glass building connected to historic structures on either side via glass walkways and elevator. Concrete walkways mark the path of travel. A darkening dusk sky contrasts with the luminous glass box and exterior lighting. Colored rendering showing Wesleyan campus and highlighting project and landscape. Old black and white photo shows the view from the road of the project’s two historic buildlings with sparse trees and paths. Black and white computer generated image of floor plan depicts the new building connecting the two original buildings. Details include path of travel, vertical elevations, exits and entrances, and interior layouts. Colored image of chapel post-renovation looking toward the chancel at the rear of the church with long stained class windows visible on the rear wall and a traditional raised altar area. There is a visible ramp design to the right to the flexible platform used for worship services, lectures and performances. Color photo of interior view of renovated chapel with an wood ceiling, rafters, balconies and benches and warm pink walls. The image shows the organ console deployed for concert with accessible worship, lecture and performance platform, new recital organ, balcony level chancel openings to walkway behind organ that lead to new elevator access and egress at the back. Color image of Black Box Theater with grid and theatrical lighting above and heating and air conditioning system, sidewall acoustical controls, daylight control, and vertical lighting positions integrated into exterior walls. Acoustical control over flat floor is a transparent baffle system with historic ceiling showing above. Color image from parking lot of new glass pavilion. Color photo from inside pavilion shows sculptural wood and steel supports that curve to form a vaulted ceiling. Built-in wood benches line the exterior wall. There was extensive and diverse participation in both programming and building design. Both were conducted in collaboration with a Building Committee that included members from both the faculty and administration, with the Board of Trustees and its Facilities Committee, and with building users including campus ministries, student theater, theater department and the University Organist. The design solution was to link the historic buildings with a new transparent building to provide a lobby, audience services, an accessible entrance, elevator and ramps to provide access, as well as building systems—electrical, plumbing, HVAC and fire protection—for both historic buildings. Both buildings were redesigned and equipped to provide fully accessible interiors and substantial improvements to both lighting and acoustics. A primary objective of the project was to provide seamless physical access to two historic buildings that had never been accessible. The project met and exceeded that objective by enhancing the experience of all users through sensitive choices of layout, lighting and acoustics. The work was designed in conformance with the Connecticut State Accessibility Requirements and the US Americans with Disabilities Act. The objective of the project was to provide a space that would work for anyone across a very wide set of flexible functions. The design team revitalized the historic core campus as a lively hub for dramatic and musical performances, worship, and university lectures. Robert Olson + Associates also improved the capacity and functional performance of the University’s Civil War memorial chapel for its new mix of uses. Both original historic buildings had deteriorated and required complete restoration of their exterior envelopes as a condition for their reuse. Neither building had adequate access or egress, effective life safety, audience accommodations, heating or ventilating systems, or electrical systems. Both are strikingly restored to meet a new generation of diverse University users and needs. The glass pavilion is sited between existing north and south buildings, and designed with roof overhangs to minimize heat gain and to preserve transparency by eliminating the need for shading. Jules Fisher / Joshua Dachs Associates, Inc.